This document shows how to initialize new environment on OpenStack. An OpenStack environment running one of the supported releases. See bosh-openstack-cpi for information on the CPI's support policy. Identity: BOSH authenticates credentials and retrieves the endpoint URLs for other OpenStack services. Compute: BOSH boots new VMs, assigns floating IPs to VMs, and creates and attaches volumes to VMs. Image: BOSH stores stemcells using the Image service. (Optional) OpenStack Networking: Provides network scaling and automated management functions that are useful when deploying complex distributed systems. Note: OpenStack networking is used as default as of v28 of the OpenStack CPI. To disable the use of the OpenStack Networking project, see Customize the Deployment. Access to an existing OpenStack project. An external network with a subnet, that can assign a floating IP. A private network with a subnet. The subnet must have an IP address allocation pool. Will be created by Terraform automatically. OpenStack flavor m1.xlarge The flavor is hard coded in bosh-deployment/openstack/cpi.yml. A security group, optionally created via terraform, that allows communication to the director and BOSH traffic within the group. With the create-env command described below, this security group is used for the BOSH VM itself and is the default for all VMs deployed by BOSH. If you want to use separate security groups for deployments, overwrite the default in the cloud_properties section of the cloud config. You can use a Terraform environment template to configure your OpenStack project. You will need to create a terraform.tfvars file with information about the environment. Applying the Terraform plan to the environment will output the variables necessary for "Step 2: Deploy". See the OpenStack documentation for help finding more information. Create and configure Security Groups. Allocate a floating IP address. Select Access & Security from the left navigation panel. Name the keypair "bosh" and click Create Keypair. 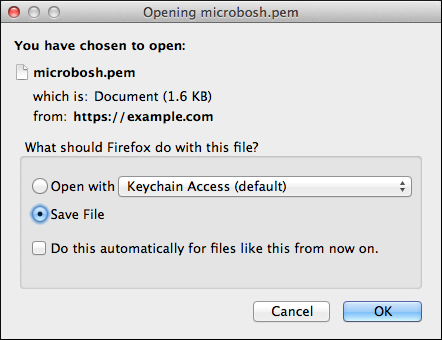 Save the bosh.pem file to ~/Downloads/bosh.pem. You must create and configure a security group to restrict incoming network traffic to the BOSH VMs. Select the Security Groups tab. Name the security group "bosh" and add the description "BOSH Security Group"
Select the BOSH Security Group and click Edit Rules. It highly discouraged to run any production environment with 0.0.0.0/0 source or to make any BOSH management ports publicly accessible. Select the Floating IPs tab. Select External from the Pool dropdown menu. Replace FLOATING-IP in your deployment manifest with the allocated Floating IP Address. Put all the configuration variables into a YAML file vars.yml. Alternatively you can pass them to create-env via separate -v switches on the command line. We omit the private_key from the configuration file, so we don't have to escape multi-line strings in YAML. Loading it directly from a file with --var-file, when deploying, will keep it intact. The external_ip is only required for the external-ip-with-registry-not-recommended.yml ops file. Do not commit vars.yml into public version control as it contains credentials. You could separate those into a second YAML file, i.e. creds.yml, and load both when deploying. If you used Terraform as described in prerequisites you can use the output of terraform apply to build the configuration file. If you configured the environment manually, instead of using Terraform, downloading the RC file from OpenStack might help with figuring out the required values, like the auth_url, region and openstack_domain. The openstack_domain is the OpenStack domain of the user account. The az is probably just nova, you can use the OpenStack CLI to list available AZs: openstack availability zone list. The net_id and internal_cidr, internal_gw and internal_ip variables belong to the private subnet mentioned in prerequisites. The default_key_name matches the name of the SSH key for new VMs generated above. The default_security_groups matches the name of the group created for bosh above. The external_ip was acquired by allocating a floating IP earlier in this documentation. If running above commands inside of an OpenStack network, i.e. if the bosh CLI is installed on a jump host, we can omit the external-ip-with-registry-not-recommended.yml ops file and optionally remove external_ip: from the vars.yml. Then we would have to connect to the internal IP directly. Refer to Exposing environment on a public IP for additional information. It highly discouraged to expose the BOSH directors management ports in an production environment. The default security group allows access to these ports. The IP is used in generated SSL certificates, make sure to change or remove the director-creds.yml variable store after changing the IP to regenerate the certificates. See OpenStack CPI errors for list of common errors and resolutions. Depending on previous choices you might have to use the internal IP instead of external_ip.